MUNICH--(BUSINESS WIRE)--SimScale has reached a milestone of 10,000 users on its web-based 3D engineering simulation platform, the company revealed in an announcement today. SimScale also released the latest platform version, including new finite element analysis capabilities, multiple user interface improvements and several new online tutorials. SimScale already has users from 190 countries. The users are engineers and designers simulating a wide range of products in various industries, using structural, fluid flow, thermal and acoustic simulation methods. For example, Custom Machines is an engineering design consultancy in Ballarat, Australia, that specializes in machine design for a broad range of industries including mining, rolling stock, confectionery, agriculture and manufacturing. For their recent project, the SimScale platform was used to optimize the design of a custom-made load cell. To that end, SimScale also opened its platform recently to the academic community. The SimScale Academic Program provides free access and resources to students, professors, and researchers to learn, teach and use engineering simulation and related technologies – from anywhere, without needing to download software. The first student contest is to create an impressive visualization screenshot, based on the SimScale tutorials, online part libraries or a student’s own project. Students will get first-hand insights into simulation technology, and in addition, the ten most impressive screenshot images will win attractive prizes. Details of the contest are available at www.simscale.com/academic. 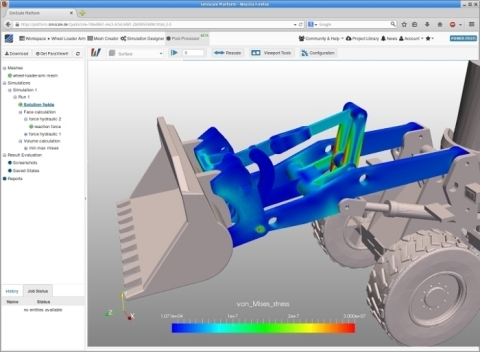 SimScale GmbH develops a novel web-based platform that drastically simplifies the access to numerical simulation. The company and its five founders – mechanical engineers, computer scientists and mathematicians – are driven to create a platform that revolutionizes the way Computer-Aided Engineering is done. SimScale encapsulates a broad range of simulation tools from fluid mechanics, structural mechanics and thermodynamics in a single user interface which can be tested free of charge on www.simscale.com. After the development of the prototype, the first investment in SimScale was made by High-Tech Gründerfonds (HTGF), BayernKapital and a business angel consortium at the beginning of 2013. A new round of financing was announced in November 2014, led by Earlybird, a leading global venture capital firm, and including all the original investors. More information about SimScale is available at www.simscale.com, and read our latest blog post – “SimScale Goes Back to School” – highlighting our SimScale Academic Program and Launch Contest. Follow SimScale on Twitter, LinkedIn, Google+, Facebook, and Xing.